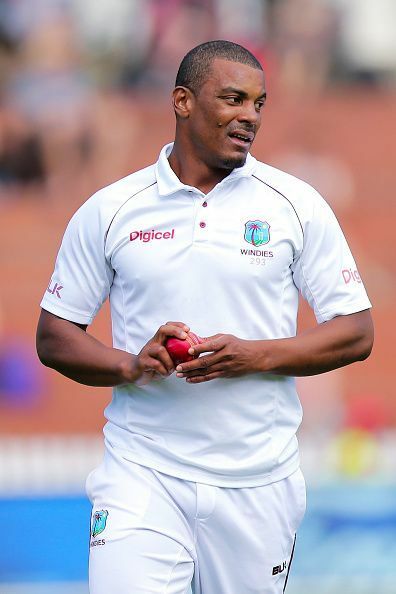 Shannon Gabriel is a West Indies fast bowler born on 28 April 1988 in Trinidad and Tobago. He is a right-arm fast bowler with a right-handed batting style. In 2011, during the West Indies tour of England, Gabriel was selected as a replacement for Ravi Rampaul, who was dropped due to his neck injury. On 17 May 2012, Gabriel made his international test debut against England at Lord’s. He was unimpressive in his debut match and was sent home. He collected a bowling figure of 3/60 in first innings and 1/26 in the second. On 21 June 2016, Gabriel made his ODI debut against Australia in a tri-nation series at Bridgetown. He dismissed Usman Khawaja of Australia and took his first ODI wicket. In this match, he bowled for nine overs and collected a bowling figure of 1/43. Gabriel was among the 15 youngsters picked up as the first batch for the Sagicor West Indies Cricket High-Performance Centre, an initiative launched by West Indies Cricket Board to improve the quality of young cricketers aged between 19 to 27. Gabriel managed to impress the selectors with his consistently impressive performances in domestic cricket, winning him a place in the national squad for the 2011 Champions League Twenty20. The test match during the Pakistan tour of West Indies in 2017 at Bridgetown had brought him a huge fame as he was able to achieve his second five-wicket haul and his career's bowling figure of 5/11. He was also declared as the Man of the Match in this test. Gabriel made his First-Class debut for Trinidad and Tobago when he was 22 years old. He played 75 first-class matches and took 191 wickets in first-class matches. His best bowling figure in first-class matches is 5/29.